The change came like the turning of the last minute into midnight. Autumn made its final bow and gave the stage to Winter in the twilight hours of our sleep. If you did not know the date you would think nothing has changed. The sun still shone through its chilly veil in the morning hours whilst the leaves continued to perform their pirouettes from their barren stems down to the dew-drenched ground. The first day of Winter looks remarkably like the last weeks of Autumn. Soon enough it's signature sleet and rain will colour our skies grey and cheeks ashen. taste: 4.5/5. Finger lickin' chicken. Hubby adored this - all three times I have made it. The spicy paprika and warming maple play wonderfully with the piney rosemary and juiciness of the sweet pear. 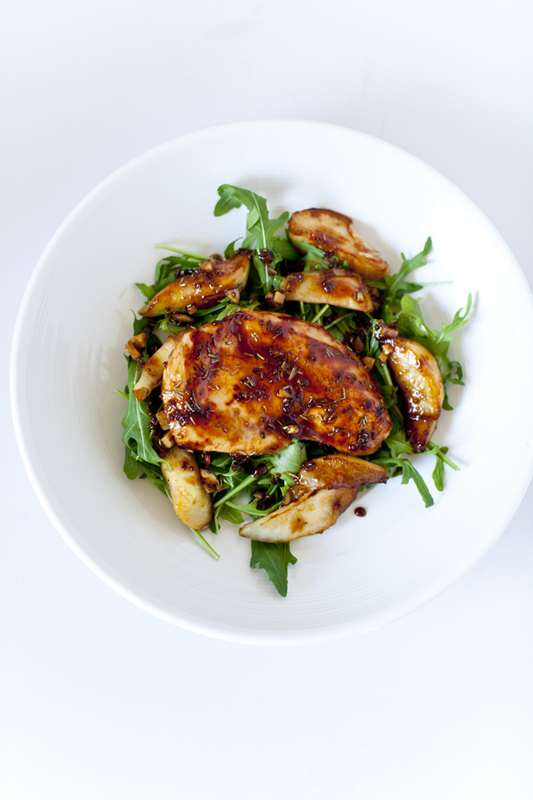 The balsamic and mustard glaze bring further heat and sweet acidity; combined with the peppery rocket they make a great flavour combination for the chicken. I subbed the baby spinach for arugula (rocket) and chose to slice the pear into wedges to retain more juice and substance. I also doubled the amount of marinade and glaze as you can always have more, and used one pear per person. Fantastic combination of sweet & savory. Beautifully presented. yummy comfort food....great combination of flavors. I guess considering out weather differences, I should be reading you in the winter and vice versa! We're getting so hot here! 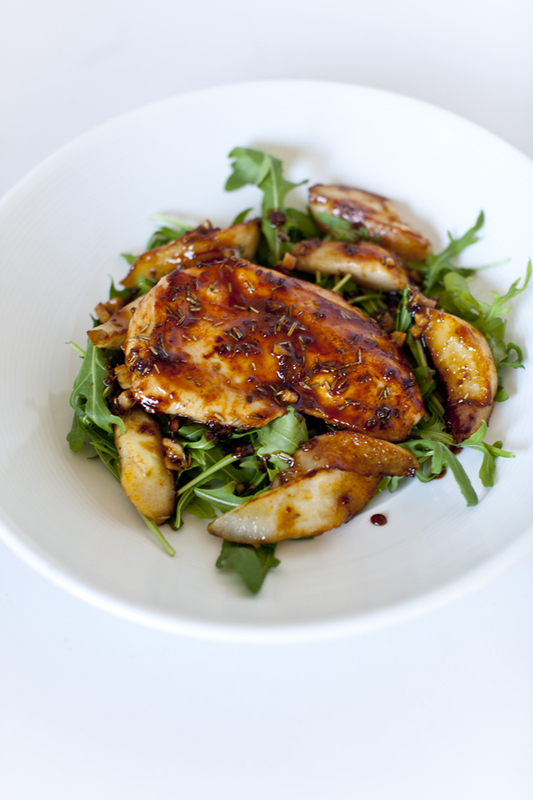 I love the idea of pear with chicken and the glaze is full of so many flavors! Super mouth-watering photo! I love you photography and was wondering what set up you have? I was interested in the lighting that you use? I made this tonight to celebrate our 21st wedding anniversary. I used pork and apples instead of the chicken and pears. I also diced some sweet potatoes, and fried them until brown and crispy instead of the puree. It was one of the best meals I have ever made! Next time, I will make more marinade for the glaze; just using the leftover marinade was not enough. Thank you so much for sharing this recipe; it made our celebration even more special!